I have to admit before this trip to Albania, I would have said Albania was my least favorite country in Europe. 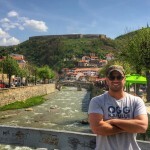 My last trip in 2007 ended up with me getting the bird flu amongst a series of mishaps during our 3 days traveling from Montenegro down to Greece with a few stops along the way. I had always wanted to revisit and change my feelings as I’ve always heard pretty good things about Tirana and Albania. 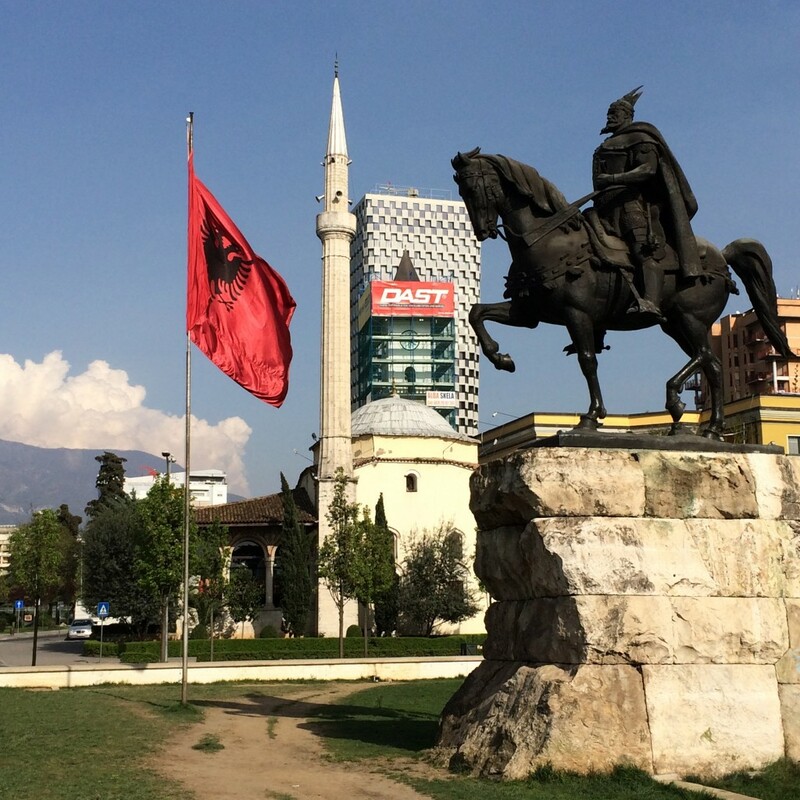 So after 2 days in Tirana, I feel a lot better about Tirana and more importantly about Albania in general. Here’s what we did with 2 days in Tirana. There’s no super easy way to get to Albania from the United States. There are no direct flights so it will always require a layover. 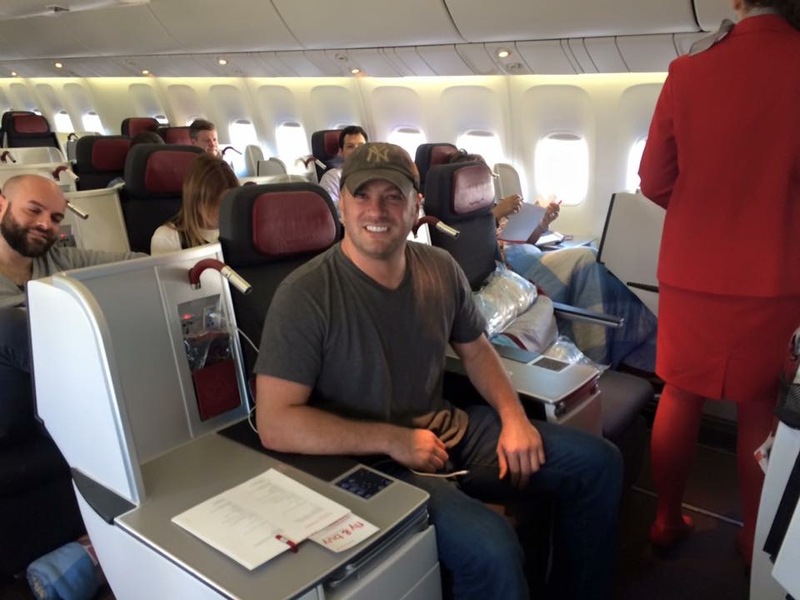 I flew Austrian Airlines from New York to Vienna and onto Tirana. From the airport it’s a 20 euro or 25 dollar flat fee into town and all of a sudden I arrived at the Sheraton Hotel in Tirana. 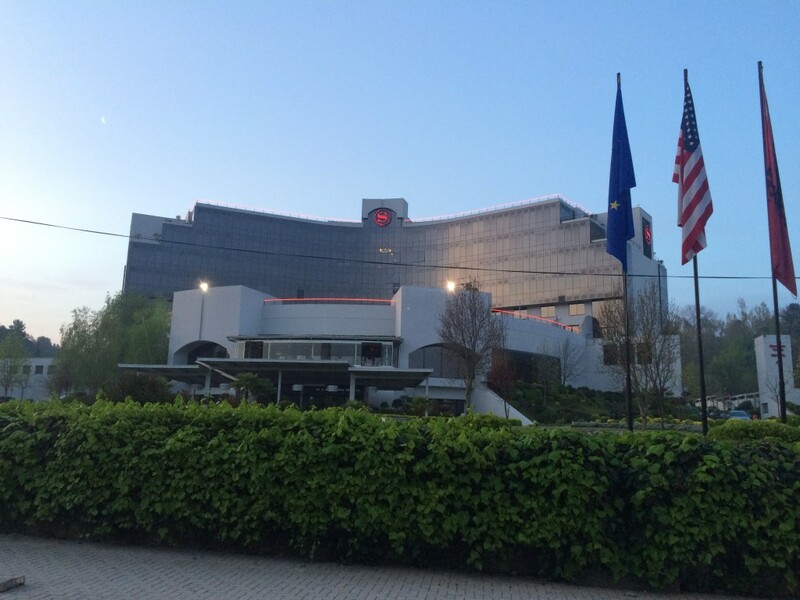 The Sheraton Tirana is an OK Starwood hotel but has an excellent location. 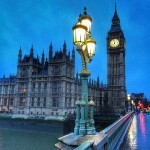 Everything you want to see and everywhere you want to go is within a 10-15 minute walk. There is a good lounge with marginal breakfast but the best thing is they have a refrigerator devoted to San Pellegrino water-my favorite! 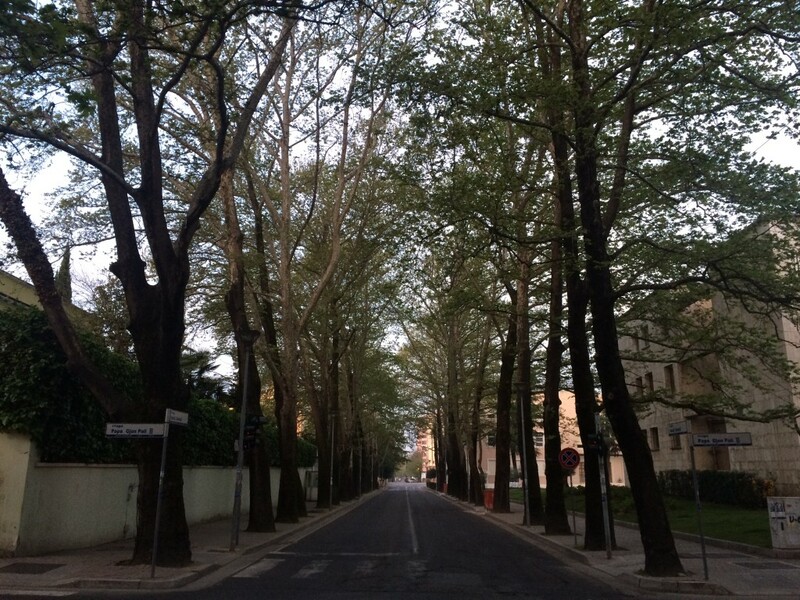 The Blloku neighborhood of Tirana is the place to be in town. This is where all the restaurants, bars, shopping and nightlife live. 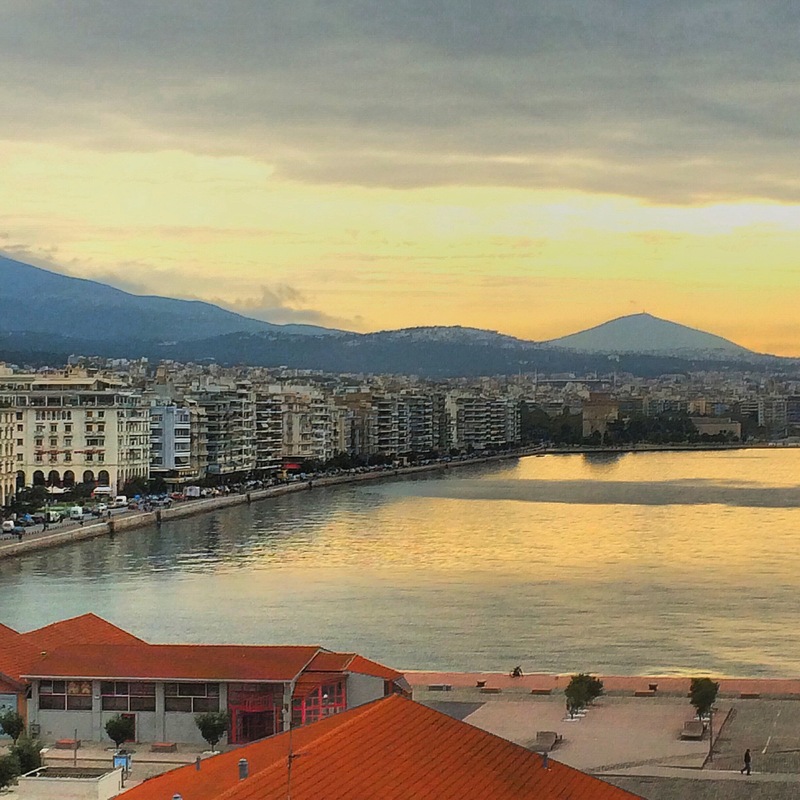 This is where well-dressed trendy Albanians strut their stuff. 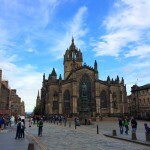 Blloku wouldn’t be out of place in any major European city. Some of the old school habits are still annoying like smoking in bars and restaurants but it is Eastern Europe so you deal with it. 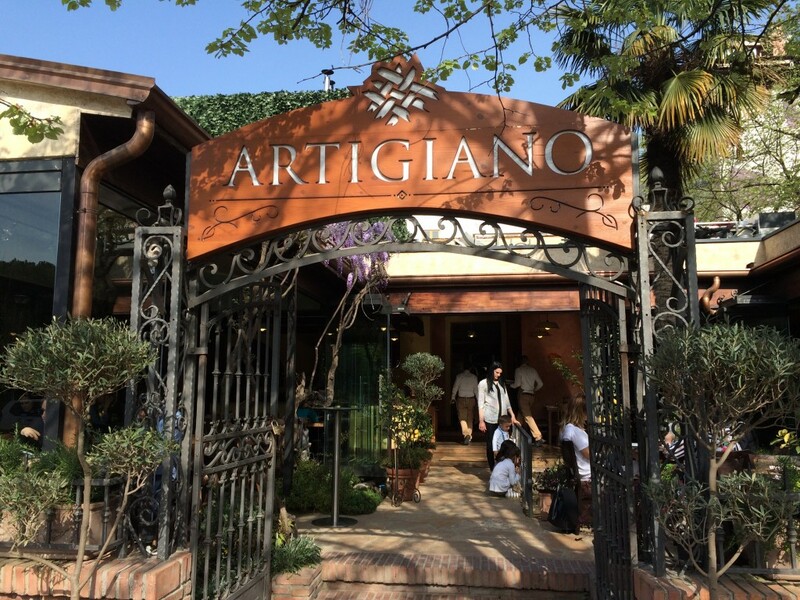 My favorite spot was Artigiano for fantastic Italian food. Italians have had a major influence on Albania and much like Eritrea; they do very good Italian food and coffee. Artigiano was very cheap for high quality food, wine and cocktails. 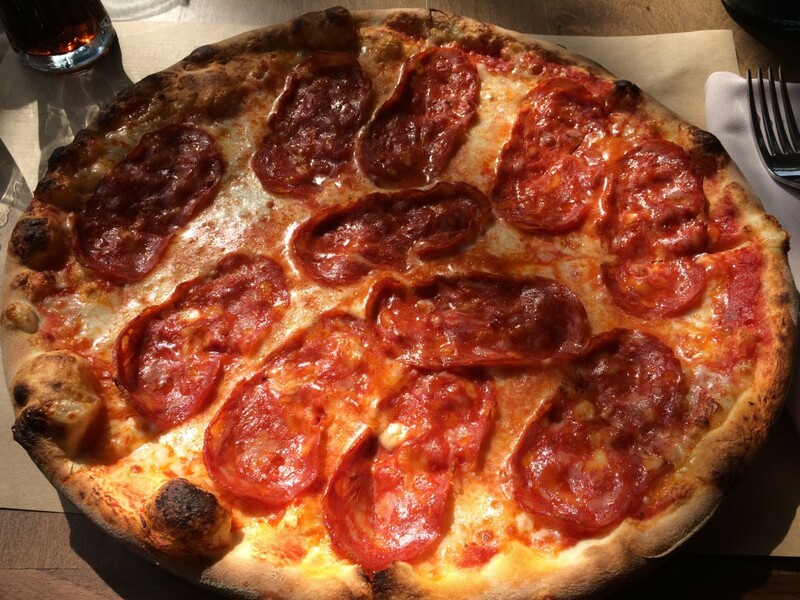 Try the burrata pizza with hot salami-it’s fantastic. If you’re looking to watch a game, then check out the Irish pub called Meduza’s. It’s on a really cool tree lined street with a lot of other bars and restaurants. 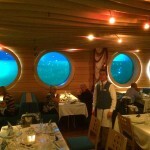 It was the perfect place in town to watch El Clasico even though FC Barcelona lost! The place was packed and the bar food was decent. However, my two favorite places for drinks were the Sky Bar and Tao. 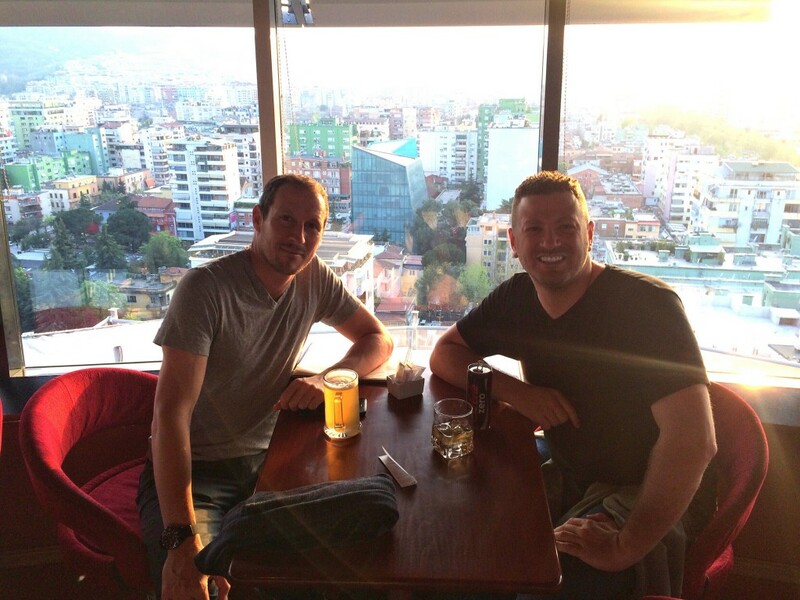 Sky Bar is at the top of a tall building in Blloku and gives the best views of the city in a revolving rooftop bar. It took a few minutes to get used to but you adapt quickly. Down on the ground there’s a fun bar called Tao. It’s a really trendy, cool place outdoors to hang out and watch the elite of Tirana do their thing. 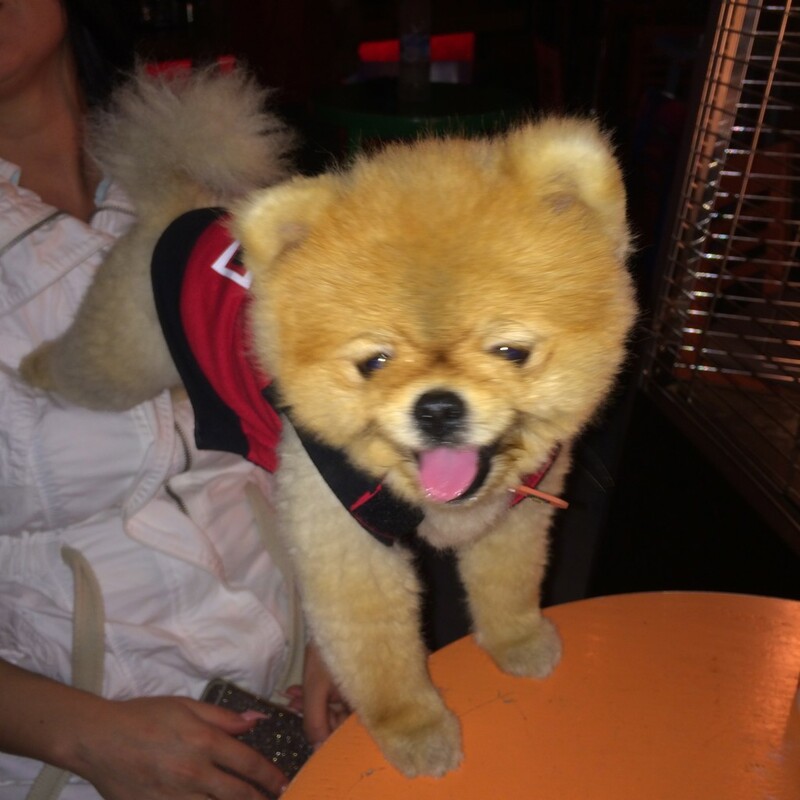 You might even spot a cute puppy on a table! As far as sights, Tirana is not exactly Paris. However, seeing the contrasts of the city from their communist, Ottoman and Italian roots is pretty cool. 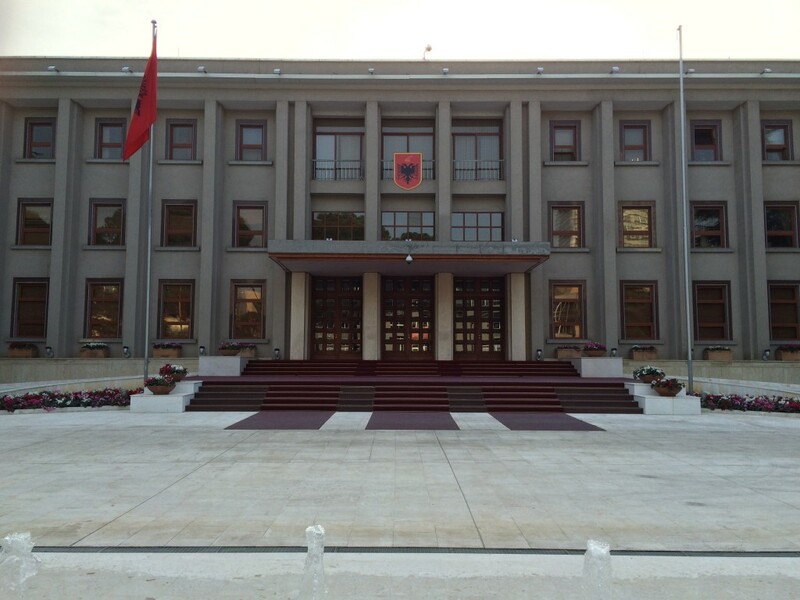 The main vein of the city is Skanderbeg Square. This is where everything in town seems to start and end. It’s not the prettiest plaza you’ll ever see but it is a pretty good example of modern day Tirana with a little bit of everything. 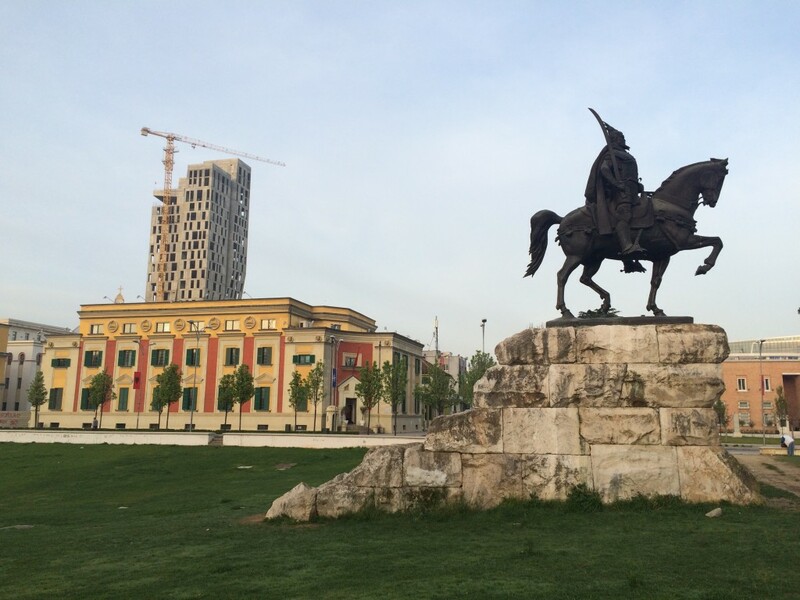 There is a big statue of Skanderbeg, the Albanian national hero, on horseback flanked by a mosque and some old school communist buildings that are now used by the government. There is also an opera house, hotel and grand boulevards leading in all directions. I’m not a big museum guy at all so we didn’t visit any museums but some of the buildings themselves are worth a look. 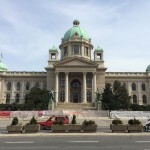 Especially the Archeological museum by the Sheraton Hotel after a long walk down a massive Stalinesque grand boulevard that looks like it could be in Minsk or Moscow. So with 2 days in Tirana, I suggest chilling out, walking around the city, having excellent coffee in the numerous cafes and centering your dinner and nighttime activities on the Blloku neighborhood. You won’t be disappointed if you stick to this area of town. Outside of Blloku and the main square area it gets a little sketchy and much less interesting outside of some of the paint jobs on buildings. 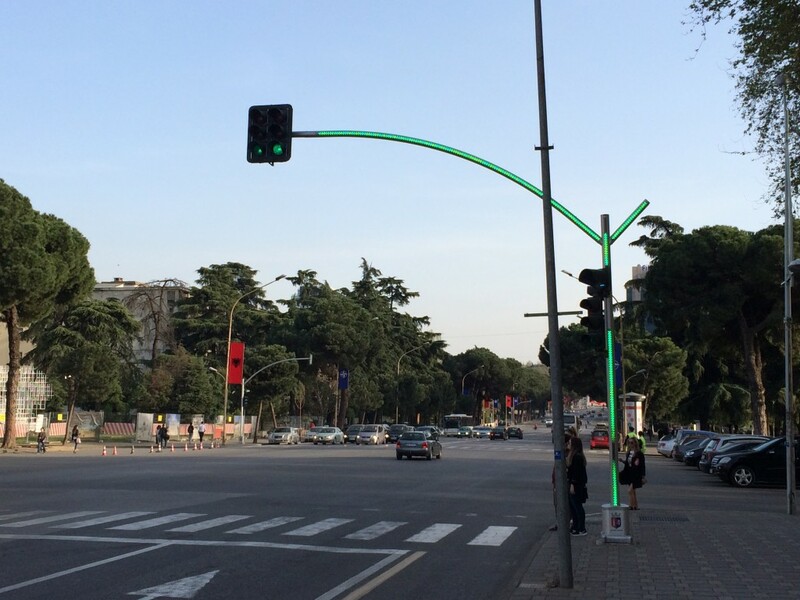 Finally, and this may sound weird, one of the coolest things about my 2 days in Tirana was seeing the traffic poles that hold the traffic lights all lit up in the color of the traffic light. 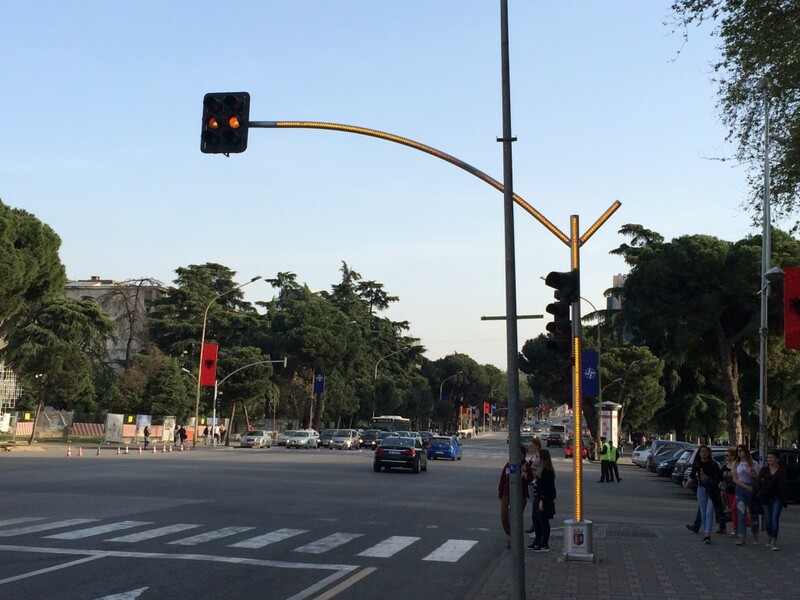 So the entire pole would change to red, yellow or green depending on the light. I’m not sure why but I thought this was so cool! Anyway, that was essentially my 2 days in Tirana, Albania. It’s not a great city but it’s definitely pleasant enough. Today we start a massive road trip around the Balkans and we may or may not come back to drop the rental car off in Tirana. We’ll see how we’re going and make a decision in a few days. Either way, I’m super excited and also very glad that I now how a positive opinion of Albania after my 2 days in Tirana. Sometimes after a bad trip, you need another to erase a bad memory and that’s what I did. I really didn’t like Tirana. I thought it was dirty, polluted and the people were pretty rude to us. That’s how I felt the first time! It’s definitely not a clean city but we were treated very well this trip. I believe that 2 days is the perfect amount of time to really get a feel for Tirana but there’s so much more in Albania to discover, I hope you get to see and do more. Yes I agree and did a road trip out of it this time and last time basically covered the whole country all the way from Montenegro to Greece including the old ruins. There’s always more to see and do in Albania or any country. You got bird flu? That’s awful, I would NEVER go back! Interesting!! 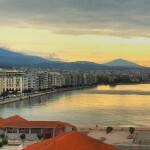 It’s Great that you went back to Tirana to change your feeling about it…Interesting to read your experiences at Tirana…. Thanks! 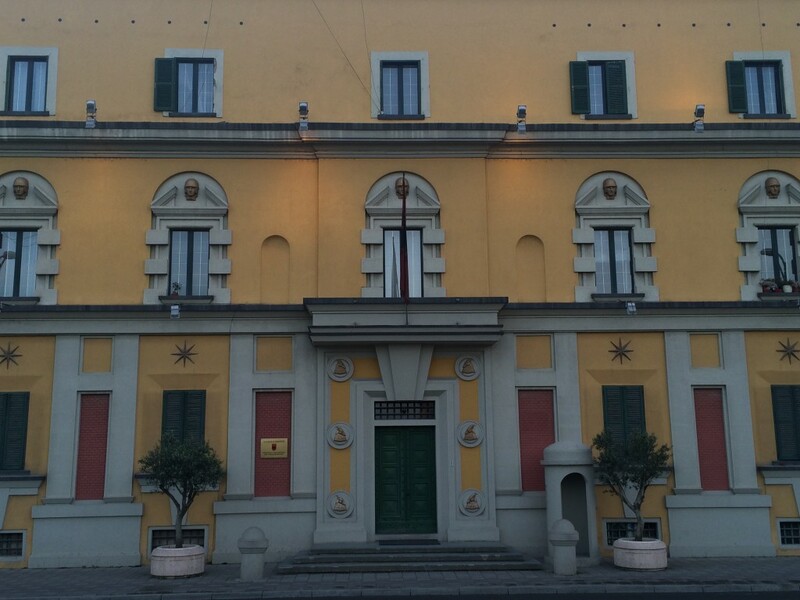 Yes I hate having negative opinions about places but your experience is what it is…some people hate Italy! Great post! 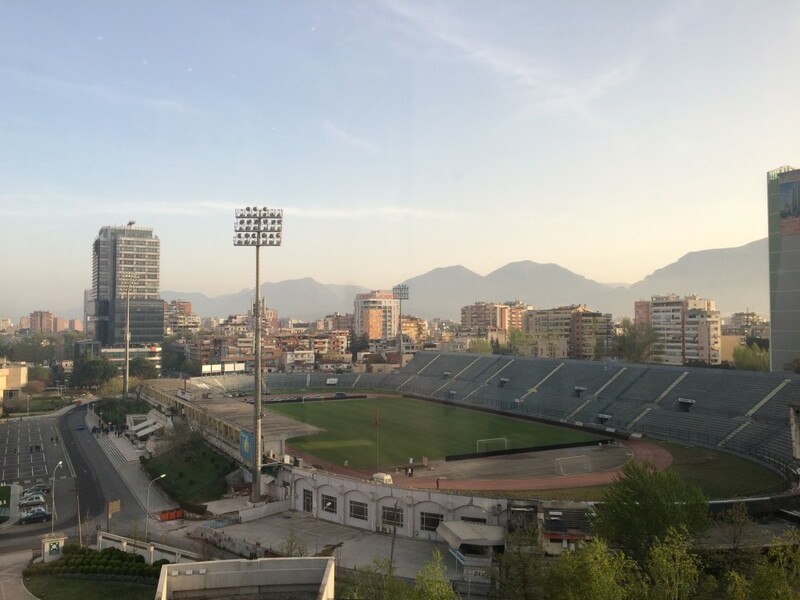 I totally agree that Tirana is not much to look at but it is the gateway to the rest of the country which has some pretty spectacular spots with historic sites, local culture, surprisingly good food and wine, and unspoiled nature. I wish you had more time to maybe travel over to the Lake Ohrid or down south along the Albanian coast. I was in Ohrid the other day, absolutely stunning and have previously don’t the southern coast and spent some time in Saranda.